Bob Buford believes the second half of your life can be better than the first. Much better. But first, you need time to figure out what you want to do with the rest of your life. So he recommends that a reader call "halftime" to reflect not only on where he's going, but why.In Halftime, Buford focuses on this important time of transition--the time when, as he says, a person moves beyond the first half of the game of life. It's halftime, a time of revitalization and for catching new vision for living the second, most rewarding half of life.As Buford explains, "My passion is to multiply all that God has given me, and in the process, give it back." That requires asking important questions: What am I really good at?What do I want to do?What is most important to me?What do I want to be remembered for?If my life were absolutely perfect, what would it look like?Buford fills Halftime with a blend of personal insight, true-life examples, and quotes from those who have successfully navigated the exhilarating and potentially dangerous shoals of midlife. 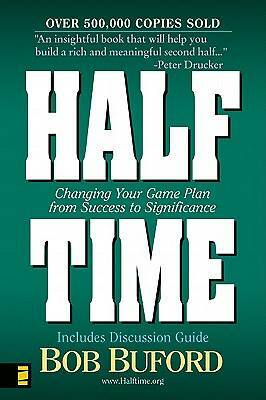 Complete with a discussion guide, Halftime provides the encouragement and wisdom to propel your life on a new course away from mere success to true significance--and the best years of your life.